Back a few weeks ago I was writing a blog on Best Date Night Restaurants in London. I clicked on to the website of extravagant Russian restaurant Bob Bob Ricard and noticed something they are doing that I think could completely change the way we eat at restaurants. Hands up have many of us have been looking for a flight or a train somewhere recently? Hands up how many of us have found that the ‘best’ times are always the most expensive? The ones that get us to our destination at a comfortable time are always a lot pricier than the awkward middle of the day options. So, why is this? Simply because of demand. The higher the demand, the more money they can charge and the more money they will make. It works in the reverse as well where travelling at a more inconvenient time is usually a lot cheaper. Well, what if restaurants started doing this? Pricing their menu based on days, times and demand? What would that mean for them as business owners and us as customers? Dynamic pricing is not a completely new concept when it comes to restaurants and the good old pre-theatre menu has been doing a variation of this for years; A concept where if you eat between 4 pm – 6 pm you can take advantage of a cheaper priced menu. Soho based Bob Bob Ricard has taken this idea to the next level and split their entire menu into off-peak, mid-peak and regular pricing where you get a discount (or not) depending on the time and day you visit. Before we start to think that a peak menu means a £100 chicken burger on a Saturday night it doesn’t. 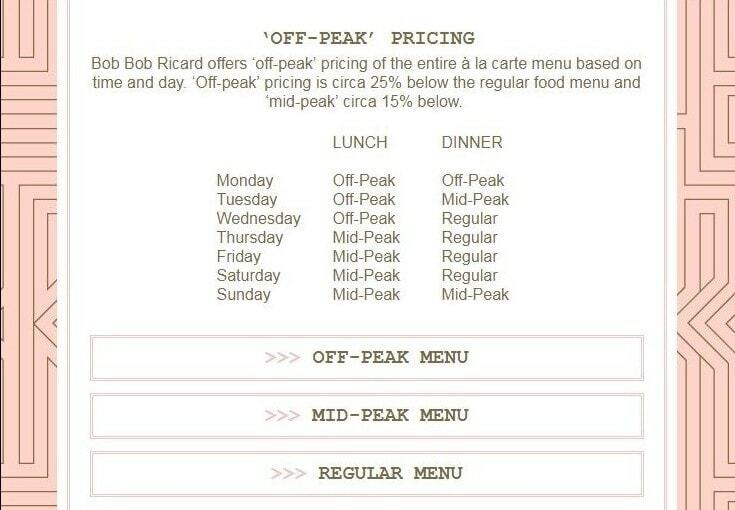 In fact, the way Bob Bob Ricard has approached this is that they haven’t inflated their peak menu prices at all. All they have done is made the other times cheaper. This means that this once very fixed menu has become a lot more accessible to people on all budgets. It means it gives us the freedom to choose what suits our situation best. It means it gives us flexibility and options. Some great advantages for the customer, but what does that mean from the business’s point of view? There is a risk the business could potentially lose money based on customers that already visit during these off-peak times. As well as the chance that a peak priced day like a Saturday night could become less busy. Just to throw something else into the mix there are some people out there who could be turned off or embarrassed by visiting at what is known as an off-peak or ‘cheap’ time of day and instead go elsewhere. (I can safely say I don’t fall into the category!) However, with all those negatives in mind, haven’t the business just opened up their doors to an audience they didn’t have before by being more flexible which means potentially thousands more customers? This could be something that would only work for those higher end places where the menu is higher priced already and who have the room to be flexible, but if we’re creative about this then this concept isn’t just fixed to a discount on the menu. What about offering a free drink during off-peak hours or a voucher for 10% off next time you visit if you come at a peak time? What I’ve learnt from all this is that if restaurants do their homework and implement it properly through research it could be the future for our eating habits (and our wallets). We save money, they (potentially) get more custom. It really is a win-win all around. 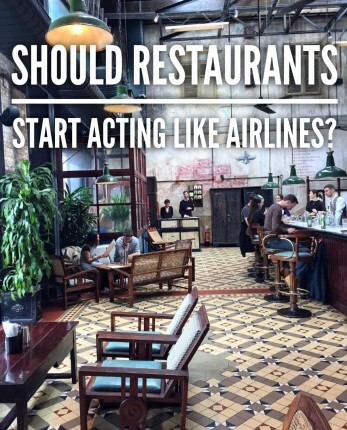 So if any restaurants are reading this, is this something for you to consider?